Newly found graffiti at the Curry and McKay area around Grove. 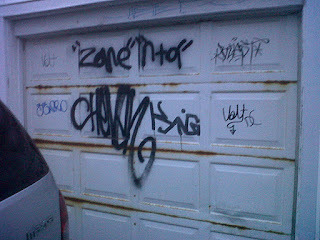 I live on Pelletier close to Curry, and I have a garage, with ally access and noticed on Saturday that my garage door got "tagged" with blue spray paint with the initials DCB? I think.or CBD something like that. So, now my beige garage, had black and now new blue graffiti paint. How do I get this off my vinyl siding and my garage door? just letting you know that we have an "artist" around the area. This morning I had breakfast with a few friends at The Station restaurant located at the end of Pelletier St. just east of McKay Ave. It has been a few months since I've been to The Station as I used to frequent the place regularly over the past few years. For those who have never been, I highly recommend you check it out. It's almost hidden, located at the end of Pelletier St. before the tracks, but it has great breakfast (they also serve lunch and dinner) for very low prices considering the quantity of food you are getting. It also has a bit of history. For those unfamiliar with the area, it is where our train station used to be until sometime before 1984 when the station ceased passenger travel. After many years of vacancy, an arsonist put an end to the station on November 15, 1996. However, the restaurant behind the station did not burn down and has been a local gem for the west-end community ever since. This happened on the 900 block of Mcewan. Police were notified. There was a rash of car breakins Thursday evening/morning in the 200 block of Josephine Ave. About three or four cars had there windows smashed. Unkown as to what was taken. Cops were called and took a report and location of the crime. Thanks. Recently I was nominated as a "Rising Star" in the Windsor community from the Windsor-Essex Regional Chamber of Commerce. The Chamber is hosting an awards gala in April and at the gala I will be featured on video and will also be aired on Cogeco channel 11. They wanted to feature the work I've been doing in the west-end and asked if I could round up some residents in the area to be featured as well. We will be shooting primarily in the Bridgeview area but also perhaps in neighbourhoods close to the University and Sandwich Towne. I wanted to let you know that I had my BBQ stolen on New Year's Eve, shortly after midnight. I informed the police of the robbery. It was a Centro black and silver model. They threw the propane tank into my backyard and wheeled the BBQ south along the alley that separates the 100-200 blocks of Campbell and Josephine. Car Break In on University Ave.
Hello: Went for breakfast at SUBWAY,on University Ave.,on Saturday AM and ... the owner mentioned to me that his car was broken into,plus some othere residents had there cars broken into as well. I do not know when this happened but sometime within the week.